Shinmei Shrine (神明神社, shinmei-jinja), see photo of shrine here, enshrines the Ishigami-san (石神さん, “Honorable Stone Goddess”), who according to shrine tradition, will grant the fulfilment of one wish to each female visitor. Ama women and the locals have worshipped “Ishigami-san” of Shimmei Jinja Shrine since ancient times. With Ishigami-san’s guarantee to fulfill one wish of any female worshipper who comes to visit the Shrine, the shrine remains a magnet attracting many female visitors till this day. About a 20min. 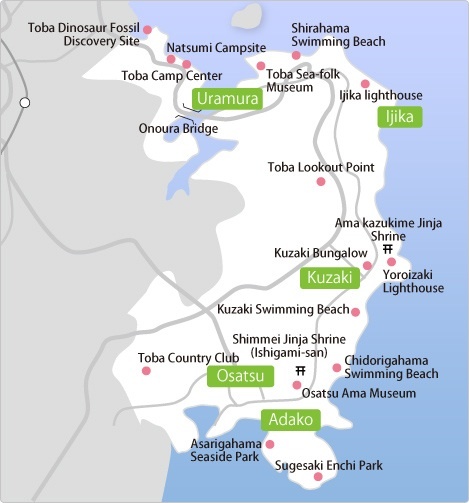 drive from Toba station, spectacular views along “The Pearl Road” alongside the series of ria coastline geographic features are among the famous natural attractions of the Ise-Shima National Park. The Toba Sea-folk Museum with over 57,000 ocean-related archives, and a lookout point with an extensive panoramic view are also a part of these attractions. In the towns along Pearl Road, the ancient heritage of the Ama, women divers, can be observed. Ama huts called Amagoya, are popular touring spots where meals are served while enjoying friendly conversation with the divers. The fishing town of Ōsatsu has the highest population of ama (海女, “female diver”) in the Toba-Shima region. The ama have been supporting their families as wives and mothers as well as economically by their hard, restless work. Even though they endure harsh working conditions and busy lives, the divers have always been happy with their lives by taking pride in being an ama and by spending heartfelt conversations with their companions in the diver huts (海女小屋, amagoya). The Osatsu Ama culture museum seeks to provides visitors with an opportunity to get to know the history and life of Ōsatsu, nurtured by the kindness of the ama. The Toba City Shinmei shrine, and the Ama deity are thought to be connected to Ise-jingu since ancient times, and could also be related to the Amanawa_Shinmei shrine in Kamakura, on account of the rarity and uniqueness of the Shinmei-zukuri construction style adopted for this class of the most ancient shrines. This shrine along with the Ise-jingu and Atsuta shrines, are all shinmei-zukuri shrines which enshrine and venerate Amaterasu as goddess. Shinmei-zukuri (source: A Popular Dictionary of Shinto, by Brian Bocking) or ‘Shinmei-style’ is the primal style of shrine architecture (-zukuri) used for the main shrine (mi-shoden) of Ise jingu (which is the only example technically known as Yui-itsu-shinmei, ‘unique shinmei’), and for some shrines elsewhere. The Atsuta jinja was rebuilt in 1935 in shinmei style. It is one of the oldest styles and features primitive building techniques in a spare and immaculate straight-line design, apparently deriving from Polynesian or south Chinese storehouse architecture. Rebuilt on adjoining plots every twenty years (see Shikinen sengu) the Ise shrine is thought to preserve virtually its original form. It is made of unpainted wood with two supporting pillars for the ridgepole, a verandah and a thatched roof with ten logs (katsuogi) placed across the ridgepole at intervals and two long slender bargeboards (chigi) pierced with ‘wind holes’ (kaze-kiri) projecting in an X shape above the ridgepole at each end. Amanawa Shinmei Shrine (甘縄神明神社 Amanawa Shinmei Jinja?) was founded in 710 and is the oldest Shinto shrine in Kamakura. It is dedicated to the sun goddess Amaterasu. According to the ancient document History of Amanawa-ji Shinmei-gū kept by the shrine, the founder of the shrine is famous priest Gyōki; a powerful and rich man named Tokitada Someya supported the construction. The shrine consists of two structures: the haiden or oratory in the front and the honden or sanctum at the back. Both the oratory and the sanctum have hornlike crossing planks called chigi rising above the roof at both ends. Also five short logs called katsuogi are placed at a right angle along the ridge of the roof. This is typical of a Shinto architectural style called Shinmei-zukuri. As the old structures were destroyed by the Great Kanto Earthquake in 1923, they were rebuilt in 1936. The last reconstruction was completed in 1998.